Luther Believed Prophecy to be Active Today? "Astronomy, on the contrary, I like; it pleases me by reason of her manifold benefits. General prophecies and declarations, which declare generally what in future shall happen accord not upon individuals and particular things" (Table Talks, Of Astronomy and Astrology, DCCXCVIII). In regard to the German, the quote was probably taken from a source similar to Dr. Martin Luthers Sämmtliche schriften, Volume 22, 1550. Both sentences are separated by a fair amount of text, including a sub-heading. 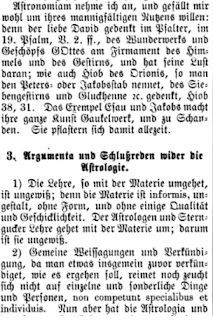 The first line is "Astronomiam nehme ich an, und gefällt om wohl umb ihres mannigfältigcn Nutzes willen." The second line further down is "Gemeine Weissagungen und Verkündigung, da man etwas insgemein zuvor verkündiget, wie es ergehen soll, reimet noch zeucht sich nicht auf einzelne und sonderliche Dinge und Personen." This quote as it's been cited in English above was taken from an early English edition of the Table Talk. The version being used appears to be from a later reprint of the Hazlett edition (also found on the CCEL website). The number DCCXCVIII appears to be a later renumbering of the earlier edition. Earlier editions number this entry DCCCXLII. I'm absolutely certain the quote as it's cited above and found in early Hazlett editions is an edited version of a much lengthier utterance in English from Luther on Astrology. The unedited English can be found here starting at the bottom of page 309. Compare this with other later English editions. An astrologer and a star-peeper, is to be likened to one that selleth dice, and saith, Behold here I have dice that always run upon twelve; the rest of the fifty casts, they run upon two, three, four, five, six, seven, eight, nine, ten, eleven. Even thus it is with the astrologers; when once or twice their conceit and fantasies do hit, then they cannot suficiently extol and praise the art; but touching the other so often failing, of the same they are altogether still and silent. I accept of astronomy (said Luther), it pleaseth me well for the sake of her manifold profits. David, in the 19th Psalm remembereth the wonderful works and creatures of God in the firmament of heaven, he taketh therein his delight; Job also remembereth Orion, which they call Jacob's staff, the seven stars, &c. To conclude, the example of Esau and Jacob maketh astrology merely a juggling and confounded work, therewith the astrologers always have enough to do to plaster themselves. First, that doctrine which dealeth and handleth a matter is uncertain; for materia est informis, is without shape and form, without any quality and fitness; the doctrine of the astrologers and star-peepers dealeth and handleth touching matters, therefore astrology is uncertain. 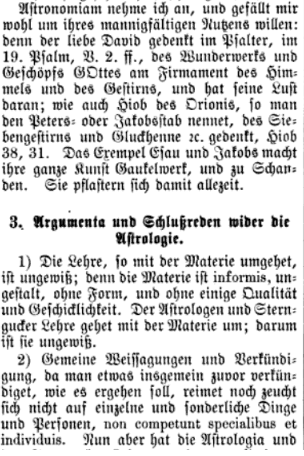 Secondly, General prophecies and declarations, when they will declare a thing generally before what in future shall happen, neither do accord nor draw themselves upon singular and particular things or persons; non competunt specialibus & individuis, they agree not to specials and individuals; but the astrologers and star-peepers do teach general predictions and presages which cannot be directed to and upon particular things and persons, therefore the astrologers and star-peepers do wrong, in drawing and directing there predictions to and upon particular and certain persons and things. Thirdly, When at one time many are slain together in a battle, are shot, struck dead, &c. No man can truly affirm, that they were all born under one planet, yet they die altogether in one hour, yea oftentimes in one moment, especially before the mouths of great cannon and ordnances. Even without the extended context, the subject matter of the truncated quote is about astronomy, not prophecy. I can see though how someone not being careful read the sentences as the separate subjects of astronomy and "general prophecies and declarations." In context, the comparison is between astrology and astronomy, and that Luther rejected the former and was pleased by the later. Then, the second sentence appears in the next section under the concluding arguments. The "General prophecies and declarations" are in regard to that put forth by astrology. Johann Albrecht Bengel's (a Lutheran 1687-1752) comments can be found here. He states, "Whatever or in whatever things, our heart shall condemn us, that we shall be able to tranquilize... Conscience is weak, and knows something of ourselves only, not without trembling; nor has it the ability to pardon: but God is great, knows all our affairs, present, past, and future, and those of all men; and has the right and will of pardoning." The gist of what JFB and Bengel are saying is that 1 John 3:20 is to be taken as a comfort "when our hearts condemns us" because "God is greater than our hearts." If one reads Calvin's view on verse 20, he appears to say something quite different- that if our hearts condemn us, it is a sign of God's judgment "that they in vain possess the name and appearance of Christians." 19. By this we know that we are of the truth. This is the evidence with which we assure ourselves of our calling and by which it is established that we are standing in the truth. If I am not moved by the weaknesses of my brother, I surely do not love him. From the fruits of love we can learn that we have love. Faith is established by its practice, its use, and its fruit. For after one has devoted oneself to a life of idleness, it is difficult to raise the heart up to God. Faith alone raises us up. Hence faith must be put into practice, in order that we may be freed from an evil conscience. And in His sight we shall set our hearts at rest. The consciousness of a life well spent is the assurance that we are keeping the faith, for it is through works that we learn that our faith is true. And one day my conscience will bear witness before God that I have not been an adulterer, that I have loved my brother, and that I have come to the assistance of the poor, even though there are many things in which we have offended even a brother. 20. because if our heart blames us. God is greater than our heart. The heart knows nothing that is right. God knows everything and teaches me better things in the Word of the Gospel. 21. Beloved, if our hearts do not condemn us, we have confidence toward God. Confidence and condemnation are mutually exclusive. For if you have confidence in God’s grace, your heart does not condemn you. Love cannot calm your heart, since one often loves in words and with the tongue, v. 18. But faith, which is victory over the world and hell, as 1 John 5:4 says, calms you. From this one now understands why the devil vexes us so much, opposes the Word, and strives to take the Word away. For if the Word has been taken away, faith is taken away; if faith has been taken away, calmness of the heart is taken away. If he cannot hinder the Word, he strives to hinder faith, lest we believe the Word; he confuses and muddles the Word. If he cannot hinder faith, he strives to hinder prayer and hurls a person into so many activities that he is unable to pray. Luther, M. (1999). Luther’s works, vol. 30: The Catholic Epistles. (J. J. Pelikan, H. C. Oswald, and H. T. Lehmann, Eds.) (Vol. 30, pp. 279–281). Saint Louis: Concordia Publishing House. There's a balance to Luther's comments. In verses 16-18 he describes faith in action, in essence, how our actions prove faith. In verse 19 he speaks of the "evidence with which we assure ourselves of our calling and by which it is established that we are standing in the truth." "It is through works that we learn our faith is true." Then he continues to describe the comfort mentioned in verse 20 for those who struggle with the "fear of conscience" about their works. One can't help but wonder if Luther's being autobiographical at this point when he states, " Even if our conscience makes us fainthearted and presents God as angry, still 'God is greater than our heart.' Conscience is one drop; the reconciled God is a sea of comfort." Verse 20 is expounded as "consoling the believer whom his heart condemns" just like JFB states. 20. For if our heart condemn us. He proves, on the other hand, that they in vain possess the name and appearance of Christians, who have not the testimony of a good conscience. For if any one is conscious of guilt, and is condemned by his own heart, much less can he escape the judgment of God. It hence follows, that faith is subverted by the disquiet of an evil conscience. He says, that God is greater than our heart, with reference to judgment, that is, because he sees much more keenly than we do, and searches more minutely and judges more severely. For this reason, Paul says, that though he was not conscious of wrong himself, yet he was not therefore justified, (1 Corinthians 4:4; ) for he knew that however carefully attentive he was to his office, he erred in many things, and through inadvertence was ignorant of mistakes which God perceived. What then the Apostle means is, that he who is harassed and condemned by his own conscience, cannot escape the judgment of God. To the same purpose is what immediately follows, that God knoweth or seeth all things. For how can those things be hid from him which we, who in comparison with him are dull and blind, are constrained to see? Then take this explanation, “Since God sees all things, he is far superior to our hearts.” For to render a copulative as a causal particle is no new thing. The meaning is now clear, that since the knowledge of God penetrates deeper than the perceptions of our conscience, no one can stand before him except the integrity of his conscience sustains him. But here a question may be raised. It is certain that the reprobate are sometimes sunk by Satan into such stupor, that they are no longer conscious of their own evils, and. without alarm or fear, as Paul says, rush headlong into perdition; it is also certain, that hypocrites usually flatter themselves, and proudly disregard the judgment of God, for, being inebriated by a false conceit as to their own righteousness, they feel no convictions of sin. The answer to these things is not difficult; hypocrites are deceived because they shun the light; and the reprobate feel nothing, because they have departed from God; and, indeed there is no security for an evil conscience but in hiding-places. But the Apostle speaks here of consciences which God draws forth to the light, forces to his tribunal, and fills with an apprehension of his judgment. Yet; it is at the same time generally true, that we cannot have a calm peace except that which God’s Spirit gives to purified hearts; for those who, as we have said, are stupefied, often feel secret compunctions, and torment themselves in their lethargy. Calvin, J. (2002). Calvin’s Commentaries (1 Jn 3:19). Galaxie Software. Even though Luther and Calvin preface their comments similarly in regard to the way actions demonstrate saving faith, when they arrive at verse 20 they diverge. For Luther, he appears to have someone in mind with the "fear of conscience, or despair," the sensitive soul that realizes a look inside in light of a holy God produces a feeling of condemnation. On the other hand, Calvin says if one is lacking "the testimony of a good conscience" and has a guilty feeling, "What then the Apostle means is, that he who is harassed and condemned by his own conscience, cannot escape the judgment of God," and "The meaning is now clear, that since the knowledge of God penetrates deeper than the perceptions of our conscience, no one can stand before him except the integrity of his conscience sustains him." Here, however, arises a greater difficulty, which seems to leave no confidence in the whole world; for who can be found whose heart reproves him in nothing? To this I answer, that the godly are thus reproved, that they may at the same time be absolved. For it is indeed necessary that they should be seriously troubled inwardly for their sins, that terror may lead them to humility and to a hatred of themselves; but they presently flee to the sacrifice of Christ, where they have sure peace. Yet the Apostle says, in another sense, that they are not condemned, because however deficient they may confess themselves to be in many things, they are still relieved by this testimony of conscience, that they truly and from the heart fear God and desire to submit to his righteousness. All who possess this godly feeling, and at the same time know that all their endeavors, how muchsoever they come short of perfection, yet please God, are justly said to have a calm or a peaceful heart, because there is no inward compunction to disturb their calm cheerfulness. Calvin admits that if one seriously looks into their heart, something will certainly convict that person before a Holy God. Discovering such, a person will naturally feel "a hatred of themselves." This person however is to "flee to the sacrifice of Christ, where they have sure peace." He goes on to say that such a person discovering such dark truths about themselves are typically those who "truly and from the heart fear God and desire to submit to his righteousness." This is possessing a "godly feeling" and results in confidence toward God rather than conviction. Are Luther and Calvin saying different things? I'm sure my Lutheran friends would completely think so. Calvin and Luther certainly diverge on their explanations of verse 20. However, they both seem ultimately to have the same thing in mind, or perhaps it would be better to state they arrive at the same place. My view? I'm with Luther on verse 20, because that's the sort of conscience I have. For Calvin's view, it reminded me of B.B. Warfield's popular comment that John Calvin was the theologian of the Holy Spirit. Notice in his comment on verse 20: "we cannot have a calm peace except that which God’s Spirit gives to purified hearts." The idea appears to me that Calvin relies on the inward testimony of the Spirit to avoid having one's heart feeling condemnation before a Holy God. He speaks of those who "possess this godly feeling"and have "a calm or a peaceful heart." Before someone thinks this is subjective mysticism, notice how Calvin explains how this inward testimony emerges, "but they presently flee to the sacrifice of Christ, where they have sure peace." Above Luther says in verse 21, "For if you have confidence in God’s grace, your heart does not condemn you." It sounds very much the same to me, but being expressed differently. No, Calvin was not a Lutheran, and Luther was not a Calvinist, but there are senses in which they overlap, even when at times it appears they are saying two different things. and also view and listen to the debate on Sola Scriptura between Dr. James White and Mitch Pacwa. I think you have missed my point, Ken - I did not argue that the doctrine of Trinity is not explicitly taught in Scripture and we rely on authority of the Council, I agree with you that it is based on sound exegesis of Scripture. Scripture explicitly teaches deity of the Father, deity of the Son and deity of the Spirit, there is no question about it. However, specific Christological teachings like two wills of Christ, condemnation of monoenergism and condemnation of monotheletism byt Third Constantinople are not provable from Scripture alone (especially in the case of monoenergism, which, as I said, was deliberately vaguely defined to provide a compromise between Chalcedonians and non-Chalcedonians), thus these teachings are relying on authority of the Council. In the debate linked to below, from around the 1 hour mark to 1 hour and 8 minutes, Dr. White's questions to Mitch Pacwa answer your first objection. What Pacwa is trying to say is that centuries later interpretations are "traditions" that are developed as new issues and questions are raised, and he tries to carefully parallel those RC doctrines and dogmas with the doctrine of the Trinity. But Pacwa admitted that the doctrine of the Trinity is based on sound exegesis of Scripture. My main point was to point Avinger to the debate between Dr. White and Mitch Pacwa and the question that Dr. White posed to Mitch Pacwa, and Pacwa's answer that he admitted that the RCC has not infallibly defined any extra-biblical statement as coming from the apostles, which is not already written down in Scripture. Arvinger mostly went to the last part of my response, about the development of doctrine and the doctrine of the Trinity. I have decided to embed the debate between Dr. White and Mitch Pacwa again here. My response to Arvinger's second response, which is now edited and expanded upon. See the combox for my original answer. I confess I don't know much about "mono-energism" - I need to study that. But I know about Mono-theletism (the heresy that Jesus has only one will). That seems easy, along with the 2 persons of Christ, that He had two wills, because He surrendered and submitted His human will in the Garden when He prayed, "Not My will, but Thy will be done" (Luke 22:42) That is clear enough in Scripture, in my opinion. Monotheletism was an attempt to win the Monophysites to the Chalcedonian Creed of 451 AD. I think that the Byzantine Emperors Justinian (527-565 AD) and Heraclius (Emperor 610 to 641 AD) (and probably others between them) were too harsh against the Copts, Monophysites, Jacobite-Syrians and Armenians, (those groups that disagreed with the Chalcedonian Creed of 451 AD), and that created a bitterness among those groups with the unfortunate result that they at first welcomed the Arab Muslims when they invaded the Byzantine Empire and fought the Chalcedonian Creed Byzantine troops quartered there, but the people were mostly Monophysite. when Islam conquered in 636 AD onward. That is one of the big mistakes of the early church - the complete unity between religion and politics and military might. My main point was about those verses that seem to imply that everything the church needs for ministry will be written down. See the first article linked below for the Scripture passages. As to your very first point that you make about the issue of questioning that everything we need for ministry, doctrine, etc. was written down, and those verses I supplied seem to imply that. That point is strengthened when we understand the promise to the disciples in John 14 and 16 - "the Spirit will lead you into all the truth" and "the Spirit will teach you all things, and bring to your remembrance all that I have said to you", etc. Notice the promise is to the disciples/ apostles. This is not a general promise of guidance for the church for the rest of history, although that is certainly an application of the promise, but the specific promise here is to give the disciples/apostles the rest of revelation ("all the truth", "all things", John 16:12 - "I have many more things to tell you, but you cannot bear them now", etc.). This promise was extended to the apostle Paul later, and would include the other writers of NT books who were writing under apostolic authority. Mark writing for Peter; Luke interviewing the other apostles and Mary and other eyewitnesses, and under apostolic authority as the fellow-missionary on Paul's team; James and Jude as half-brothers of Jesus, and James is specifically called an apostle in Galatians 1:19 and 1 Corinthians 15:7, and who saw Jesus in His resurrection body. The book of Hebrews, though Luke and Silas and Apollos have also been suggested, seems to have been written by Barnabas, who is also called an apostle in Acts 14:4 and 14:14. Tertullian thought Barnabas wrote Hebrews. (On Modesty, 20) The other NT books were all written by apostles themselves, John, Matthew, Peter, and Paul. These 2 articles linked to below, at my other blog, "Apologetics and Agape", flesh that out more, as we see that the RCC has never infallibly defined any words as coming from the apostles that is not already in Scripture (Dr. White's question to Mitch Pacwa in the debate on Sola Scriptura, see in first link), and the rule of faith that functioned in the early church was a doctrinal statement, organized around the 3 persons of the Trinity, per Matthew 28:19, and whenever it is fleshed out and explicated in the early church (see in second article) it is always a doctrinal creed in content that is all Biblical truth. There is nothing in these lists of "the rule of faith" or "the tradition of the apostles" that is a particular doctrine or seed of a later Roman Catholic particular doctrine that Protestantism disagrees with. The context, especially in Irenaeus and Tertullian is against Gnosticism, which Protestantism also agrees that Gnosticism is heresy and wrong. The context of Athanasius is mostly against Arians (in his other writings, and where he writes, "Scripture is fully sufficient" (Against the Gentiles 1:3; and de Synodis 6), etc. see in this previous article) and the Tropici (who denied the Deity of the Holy Spirit), which Protestantism agrees with the early fathers that these were heresies and unBiblical. These early fathers and writers may have mentioned other things in other contexts (like the "Mary as the New Eve" statements), but those peculiar pious beliefs are not part of the rule of the faith, when it is explicated. Things like Ignatius and the Didache and others using the word Eucharist, or the word "cath- holic" are not bad in themselves in their original context. The problem is that Roman Catholicism takes centuries later meanings of these terms and reads them back into the first or second century usage of them. Such, then, is their [Gnostics] system, which neither the prophets announced, nor the Lord taught, nor the apostles delivered, but of which they boast that beyond all others they have a perfect knowledge. They gather their views from other sources than the Scriptures . . . When, however, they are confuted from the Scriptures, they turn round and accuse these same Scriptures, as if they were not correct, nor of authority, and [assert] that they are ambiguous, and that the truth cannot be extracted from them by those who are ignorant of tradition. For [they allege] that the truth was not delivered by means of written documents, but vivâ voce ("living voice") . . . This is exactly what Roman Catholics do all the time when attacking Sola Scriptura. To the left: Peter Vischer's sculpture of the Coronation of the Virgin which has been erroneously said to adorn Luther's burial vault. "Today the festival of our dear Lady, the Mother of God, is observed to celebrate her death and departure above..."
As is typical of many of Rome's defenders, they read history with Mary-glasses on. We'll see below Luther's view of the Assumption is not as it is being portrayed, either in context, or throughout the majority of his career as a Reformer. Luther's goal in issuing the festival sermons was to wean his people away from the adoration and veneration of the saints which had crept into the church in order to lead them back to venerate Christ alone and to serve not the dead but the living saints in need, according to Christ's command (Baseley, introduction). Now if you've gotten this far in this entry, you've probably noticed the dissonance. Luther is cited above saying "Today the festival of our dear Lady, the Mother of God, is observed to celebrate her death and departure above...," and "There can be no doubt that the Virgin Mary is in heaven," but Baseley, the translator says this sermon was intended to move people away from the adoration and veneration of the saints. What's going on? Well, keep your eye on the ball. Rome's defenders are doing a bit of textual sleight of hand. The sermon indeed does begin with some comments from Luther on the Assumption of Mary. Below is the entirety of his 1522 introductory remarks in regard to this feast day. It amounts to a mere three paragraphs so he could get Mary out of the way and to then move on to preach a sermon that has nothing to do with Mary. In other words, the introduction serves as an explanation as to why he will not be preaching on the Assumption of Mary on August 15, 1522! Today the festival of our dear lady, the mother of God, is observed to celebrate her death and departure above. But how little this Gospel corresponds with this is plain. For this Gospel tells us nothing about Mary being in heaven. And even if one could draw from this text every detail about what it is like for a saint to be in heaven, it would be of little use. It is enough that we know that departed saints live in God, as Christ concludes in Matthew [Matthew 22] based on the passage in Exodus [Exodus 4] where God says to Moses, "I am the God of your fathers, the God of Abraham, the God of Isaac and the God of Jacob," that God is not the God of the dead, but the God of the living. These passages sufficiently prove that they live. But we should not try to figure out what their life is like up there for it is not necessary for us to know. It is also not necessary to discover it. Reason is incapable of it. Some great masters have understanding about some things and yet not about this. For there are three states of life. First, as a child lays in his crib he lives in God but hardly perceives it Second, when we sleep we also are alive and are scarcely aware of it. Thirdly, when we definitely are aware and experience that we are living, even then we don't know how. Now since here on earth God deals with us in this meager prison (that is barely half a life), in such a way that we barely perceive how we live here, how much more can He give life in heaven where it is spacious and where is true life. So we cannot set up any definite limits or establish a rule as to how the saints live there since even here dreaming and crazy people live, but we can't imagine how. It is enough to know that they live. But it is not necessary for us to know what that life is like. That is why I have always said that our faith always must rest upon what is known. We do not make articles of faith out of what doesn't rest squarely on Scriptures, else we would daily make up new articles of faith. For this reason, those things that are necessary to believe which you must always preserve, which Scripture clearly reveals, are to be markedly distinguished from everything else. For faith must not build itself upon what Scripture does not clearly prove. So since the Scripture clearly says here that Abraham, Isaac, Jacob and all believers live, then it is necessary for you to believe that the mother of God lives. You can leave it in our gracious God's hands what that life is like. Enough said about this festival. We will say something about the Gospel [Festival Sermons of MartinLuther (Michigan: Mark V Publications, 2005) pp. 145-146]. For Luther the Assumption seems not to be so much a matter of doubt as of little importance and this is perhaps the reason, as Max Thurian affirms, that Luther did not pronounce clearly on the subject, but was content simply to affirm it. It is in this sense that Walter Tappolet interprets the Reformer's sermon of August 15, 1522, the last time Luther preached on the Feast of the Assumption. Luther had said: "There can be no doubt that the Virgin Mary is in heaven. How it happened we do not know. And since the Holy Spirit has told us nothing about it, we can make of it no article of faith ."... and then explained the significance for him: "It is enough to know that she lives in Christ, as God is not the God of the dead, but of the living..." [William J. Cole, "Was Luther a Devotee of Mary?" (Marian Studies), (1970), p. 123]. In 1522 Luther preaches on the feast of the Assumption, apparently taking this belief for granted, although he notes that it is not an article of faith. He observes that the gospel says nothing of this, and the burden of his message is that it is more important to know that the saints are in heaven, and that we will join them, than to know how they got there (WA 10, III 268) [Thomas O'Meara's Mary in Protestant and Catholic Theology (New York: Sheed and Ward, 1966) p. 118]. ...An argument from silence is recognized by all to be quite weak. It implies that one must have almost total evidence before demonstration is possible. If this is the case, one could argue cogently that there may have been airplanes in the time of Christ. Dewey M. Beegle, Scripture, Tradition, and Infallibility (Grand Rapids: Wm. B. Eerdmans Publishing Co., 1973), p. 178. In an ecumenical dialog even the Lutheran scholar Eric Gritsch made the passing remark that "Luther affirmed Mary's Assumption into heaven but did not consider it to be of any benefit to others or accomplished in any special way" [H. George Anderson, J. Francis Stafford, Joseph A. Burgess (editors) The One Mediator, The Saints, and Mary, Lutherans and Catholics in Dialogue VII (Minneapolis: Augsburg Fortress, 1992), p. 241] Gritsch's main proof? This 1522 sermon.Keep your eye on the ball again. Notice how careful Gritsch is: Luther is said to affirm Mary's Assumption into heaven but it was not "accomplished in any special way." In this brief synopsis offered by Gritsch, he appears to redefine what it means to be "Assumed" into heaven. What he gives with one hand, he takes away with the other, for being Assumed into heaven by its very nature is a special way of arriving in heaven! Assumption. Although he did not make it an article of faith, Luther said of the doctrine of the Assumption: "There can be no doubt that the Virgin Mary is in heaven. How it happened we do not know. "[Martin Luther, Weimar edition of Martin Luther's Works (Translation by William J. Cole) 10, p. 268 [link]. There can be no doubt that the Virgin Mary is in heaven. How it happened we do not know. And since the Holy Spirit has told us nothing about it, we can make of it no article of faith . . . It is enough to know that she lives in Christ. (Sermon of August 15, 1522, the last time Martin Luther preached on the Feast of the Assumption) [link]. You might also keep in mind that Martin Luther himself endorsed this doctrine four centuries before it was authoritatively defined, writing that, "There can be no doubt that the virgin Mary is in heaven, how it happened, we do not know" (Luther, Works, X:268). [link]. As far as the assumption goes, he did not pronounce clearly on this subject, but was content simply to affirm it. William J. Cole "Was Luther a Devotee of Mary?" (Marian Studies), (1970), 123 [link]. Why would these pop-apologists be so interested in Luther believing in Mary's Assumption? From how I've encountered these people, the motivation seems to be to cause dissonance in the minds of non-Roman Catholics. There are at least two arguments going on. First, Luther believed in sola scriptura, but look: he also adheres to our Mariology. If one really wanted to be a true Protestant, stop projecting current Protestant attitudes about Mary back on to the founder of Protestantism! Second, Roman Catholics are typically fairly critical of Martin Luther. But when it comes to the topic of Mary, Luther becomes the staunch supporter of Mary; a leader that all contemporary Protestants should learn a great lesson in Mariology from. If in 1530, he uses strong language in his Admonition to the Ministers, calling for the elimination of the Assumption as an aspect of the "hypocritical church," [WA 30 (2), 351] the accent should be placed more on his animosity towards the Church and the celebration of one of its feasts than on the Assumption [William J. Cole, "Was Luther a Devotee of Mary?" (Marian Studies), (1970), 123-124]. This reference from Cole is found in LW 34: 54, 57. Yes, "The Assumption of the Blessed Virgin" is listed, and Luther describes it as "The things which have been practice and custom in the pretended church." Cole is correct, it is listed along side of other feast days, indicating Luther probably had at least the Assumption feast day in view. Interestingly, Luther does though also include, "Mary made a common idol with countless services, celebrations, fasts, hymns, and antiphons" as also stemming from the hypocritical church. I would agree, the quote from Luther here is ambiguous. But, why is the Feast day of the Assumption of Mary an aspect of the hypocritical church? Luther goes on to explain that the articles he negatively listed were considered necessary articles of faith by the church when in reality they are not. Contrarily, they "seriously storm against and corrupt the Christian faith and the truly necessary things" [LW 34:59]. “The feast of the Assumption is totally papist, full of idolatry and without foundation in the Scriptures. But we, even though Mary has gone to heaven, should not bother how she went there. We will not invoke her as our special advocate as the Pope teaches. The pope takes away the honor due to the Ascension of our Lord, Christ, with the result that he has made the mother like her Son in all things” (WA 52, 681) [William J. Cole, "Was Luther a Devotee of Mary?" (Marian Studies), (1970), 124]. The feast of the ascension of Mary is completely papist, that is, full of blasphemy and established without any grounding in Scripture. For that reason we have let it lapse in our churches and have used the day to preach about how Mary went over the mountain to visit her relative Elizabeth and what happened there. In the first place there is no sign in Scripture of the feast of the ascension of Mary so that the papists themselves just use a saying from Jerome, who is supposed to have said: "I do not know whether she ascended into heaven in her body or out of her body." And how is anyone supposed to know this when there is nothing in Scripture about it? The most annoying and dangerous thing about making this ascension into a feast is that people honor the Virgin Mary and call to her, as they sing in the response: "O you pure Mother of God, we ask that you, because you were taken up to heaven, be gracious to us and make us citizens in heaven." In summary, we can see that if the Feast is rejected, it is for reasons extraneous to the fact itself, which Luther never denied. essentially, as Luther himself said in the same sermon the reason he does not celebrate it, "although she has gone to heaven" is that he sees it is a source of justifying invocation to Mary. Once again, we see here that Cole simply assumes what he's never proved, that Luther accepted the Assumption of Mary. Cole's "benign interpretation"is a malignant interpretation of the context. Luther says there's nothing in Scripture about it, and because of that, her ascension into heaven is not to be celebrated. Then one should much rather consider how Abraham delivered a beautiful funeral address about Sarah. For in the Holy Scriptures no other matron is so distinguished. Her years, lives, conduct, and burial place are described. In the eyes of God, therefore, Sarah was an extraordinary jewel on whom extraordinary love was bestowed, and she is mentioned deservedly by Peter as an exemplar for all saintly wives. He says (1 Peter 3:6) that she called Abraham lord and that “you are her daughters.” To all Christian matrons Peter holds her up as a mother. While this isn't directly related about the Assumption of Mary, it does demonstrate Luther made attempts to remain consistent on Mary's end. Notice how Luther treats Mary. He doesn't speak of some cryptic way in which Mary disappeared off the earth. No, she's placed in a list with others whose deaths are not recorded in Scripture and are passed over in silence. Are we to assume, based on Luther's words, that all the women were Assumed into Heaven? For those wanting to affirm the Assumption, no lack of information will stop them from finding the Assumption. “He rejected the festivals of Mary's Immaculate Conception, December 8, and her Assumption, August 15.” [Lutherans and Catholics in Dialogue VII, 240]. Most interesting of all, perhaps, is the realization that his burial chamber in the Wittenberg church, on whose door he had posted his 95 Theses, was adorned with the 1521 Peter Vischer sculpture of the Coronation of the Virgin, with the inscription containing these lines: Ad summum Regina thronum defertur in altum: Angelicis praelatia choris, cui festus et ipse Filius occurrens Matrem super aethera ponit. This "archaeological" fact would seem to speak volumes about Luther's final thoughts on the place of Mary in the life of a Christian. Sorry Gentleman. This sculpture is not on Luther's tomb, but rather: "the plate is the tombstone for Henning Goden, Jurist and last Catholic Provost of the Castle Church." See my previous entry here. There is nothing much new here, if you have listened to Rod Bennett in his previous testimony on the Coming Home Network, and other lectures that are on you tube and catholic web-sites (some are radio interviews and question and answer pod-casts); and if you have seen and read my previous blog posts on my friend (both here at Beggar's All, and at Apologetics and Agape). See here for Rod's lecture on the Great Apostasy in "the Four Witnesses Brought Me Home". See here on Timothy Kaufman's refutation of Baptismal Regeneration and the way Rod uses Justin Martyr to bolster the claim that baptismal regeneration was an early unanimous belief. Rod became a Roman Catholic in 1996, and has now gone on to write several more books. His newest book is The Apostasy That Wasn't. Even though both sides repeat a lot of the same arguments; I still think it is important for me to repeat the Protestant responses and apologetic answers to the Roman Catholics who keep making these claims. Even though this is all a repeat of many issues that Protestants and RCs keep debating, I wanted to have these points here together in one blog article with Rod's lecture, because it seems good to me. Again, nothing is meant as a personal attack; I am merely defending the historic Protestant Evangelical position against the Roman Catholic Apologetic arguments. Rod Bennett's recent appearance on Marcus Grodi's "Coming Home Network", again. Below is most of my response (edited and developed from the combox comments at the chnetwork site, not at the You Tube link) to Rod's interview and responses to some Roman Catholics who commented. I am not repeating the RC arguments here. In order to get the Roman Catholic comments, go the link and see the comboxes. Rod is right in that our Southern Baptist Mega Church did not teach us about church history, and it did not prepare us to understand church history. But knowledgable Protestants do not have that "great apostasy" view like the Mormons, JWs, or "the Fields of the Woods" (A. J. Tomlinson, founder of Church of God that later splintered into the Church of God of Prophesy and the Church of God, Cleveland, Tennessee,etc.) Rod tells that story of "The Fields of the Woods" and Tomlinson in his latest book, The Apostasy That Wasn't, and in his lecture, "The Four Witnesses Brought Me Home". He may have mentioned that in his first book, but I don't remember for sure. Another group that likes to promote the "Great Apostasy" theory are the the Seventh Day Adventists (who teach that Sunday Worship is the mark of the beast and was done by Constantine). Another common view of "The Great Apostasy" is like the liberal and conspiracy theory views of Dan Brown of the DaVinci Code fame or "the Christ of history vs. the Christ of faith" paradigm. Knowledgeable Protestants just don't have that view, that Rod tries to lump in with those false groups. But Rod is right that some, in fact too many, Evangelicals are ignorant of church history and many of the Evangelical free church types, many Baptists, and Charismatics and Pentecostals do see church history wrongly as in the "Great Apostasy" theory. I remember in seminary, when some one called this the "BOBO" theory, "Being true in the NT, then, "Blink Off sometime after NT was finished, Blink On with Luther". Knowledgable Protestants who believe the Bible and appreciate church history appreciate Ignatius, Polycarp, Tertullian, Irenaeus, Justin Martyr, Cyprian, Athanasius, Augustine, Jerome, the Cappadocian fathers, Anselm, etc. But they were not infallible; they made some mistakes. Knowledgable Protestants don't say "the church went totally bust" or "went off the rails", etc. At first, I thought Rod was saying that Constantine did make Christianity the state religion, rather than that is what many Evangelicals (and others also) believe. It is a common mistake repeated a lot, even in history books. A couple of the RC commenters helped me see Rod was not saying that. Rod mentioned what happened after Polycarp was burned at the stake. If one reads the account carefully, (The account of Polycarp's martyrdom is available at ccel.org or newadvent.org ) it does not say that after they buried them, they took out his bones next year for exhibition or stored them in a reliquary in a church for exhibition, or prayed to Polycarp, or kissed his bones, etc. It says that they honored his remains by gathering them up after he was burned, and then they buried them. I think Timothy Kauffman makes a good case for understanding that "depositing" just meant burial. See Timothy Kauffman's excellent article on this issue of the early church and relics here. They remembered him the next year on the anniversary of his martyrdom, but the text does not indicate that they brought out his bones for exhibition or veneration or kissing them or staring at them or praying before them. And the passage does not say they prayed to Polycarp for him to pray for them. Much of Rod's new book, The Apostasy that Wasn't, was about Athanasius and his fight to defend Nicene orthodoxy and the Arian heresy. However, Protestants love Athanasius and his fight against Arianism. He also wrote: "they (the Arians, the heretics) have the buildings, but you have the faith" (Letter 29) The heretical Arians held the external buildings and priesthood and bishoprics for some 60 years. Protestants agree with Athanasius and others who resisted Arianism. To try and imply that Protestants think the early church went completely off is wrong. Rod claimed that the Didache has a Roman Catholic mass in it. The Didache does not have anything in it that implies transubstantiation or a RC mass. It does not even imply the "real presence" in the Eucharist. The word Eucharist is used, but that is not a problem in itself. Protestants would use it, if it was not for the all the RC and transubstantiation associations with it because of the centuries of man-made traditions added to it. It just points to "thanksgiving" and being thankful for the Lord Jesus' atonement on the cross. Using the word "Eucharist" in the early writings, does not mean backloading the word with all the development of the meaning of the Lord's Supper that slowly takes place over centuries all the way up until 1215 AD. The corruptions that people like John Wycliffe in the 1300s, Jan Hus in the 1400s, and Luther, Zwingli, and Calvin in the 1500s objected to was a very slow process of an emphasis on externals, penances, works, rituals, visiting shrines and relics, and the addition of man-made traditions like purgatory and praying to dead saints, indulgences, transubstantiation, Marian dogmas, Papal doctrines, priestly ex opera operato powers, etc. that had eclipsed or hidden the true teaching of Scripture on justification and sanctification; and understanding the distinction between the two. Rod's main point is that many Evangelicals and cultic groups both seem to think that there was a great apostasy with Constantine around 313 AD - 325 and afterward. It is true that many Baptists and free church Evangelicals and Charismatics probably are ignorant of the details of church history and wrongly think there was a complete apostasy with Constantine. But this idea get mixed up with cultic groups and liberal theology and Rod does an effective job of lumping them all together. All these groups (cultic groups, liberal theology, semi-cultic groups (Seventh Day Adventism), and uninformed Evangelicals), even though totally unlike one another, seem to blame everything on Constantine. Anti-Trinitarian groups, cultic groups, historical revisionism as in the Dan Brown Da Vinci code type of thinking, and a lot of liberal theology (the whole "separating the Christ of history from the Christ of faith" liberal paradigm). We don't say the early church went off the rails completely - At least not until the Council of Trent ( 1545-1563) - that is where the Roman Catholic Church knowingly condemned the doctrine of justification by faith alone; and only then did it become a completely false church. A Roman Catholic named Anthony cited from a work attributed to Athanasius called, “the Homily of the Papyrus of Turin”. There is some doubt about the work that has been attributed to Athanasius called, "The Homily of the Papyrus of Turin" - it was found more recently and was unknown in the west for centuries. It is not part of the standard works of the early church fathers and was not in Migne's Patrology. Even if that can be proven it was from Athanasius himself, it is just his private opinion. It carries no weight at all as authoritative. We can accept the good and Biblical things from the fathers, and reject the man-made traditions and opinions as just that. They are not infallible. Only Scripture is infallible. Rod and another Roman Catholic commentator mention sacred tradition, and as we all know, their main text for that is 2 Thessalonians 2:15. Sacred tradition of the apostles was all eventually written down. 2 Thessalonians 2:15; 3:6; (very early epistles - 51-52 AD - it is reasonable to assume that the things he was teaching orally and not written down yet at the time, were later written down in other letters like Romans, Colossians, the pastoral epistles, etc.) 1 Corinthians 11:2; 15:1-9, Jude 3. The harmonization of sound exegesis of passages such as Jude 3 (the faith was once for all delivered to the saints), 2 Peter 1:3-4 (His divine power has given us everything we need for life and godliness); and John 17:8 (Jesus praying to the Father, "the words You gave Me, I have given to them" - to the disciples), John 17:17 (Your Word is truth), John 14:26 (the Holy Spirit will teach you all things, and bring to your remembrance all that I said to you), and John 16:13 (The Holy Spirit will guide you into all the truth), with 2 Tim. 3:16-17 (All Scripture is God-breathed; and is sufficient to equip the man of God for every good work), and 2 Peter 3:16 (Peter considers all of Paul's letters as Scripture), and Hebrews 1:1-3 (in the last final days, God has spoken decisively and finally through His Son) - all of these together strongly implies that everything we need was written down for us, and that with the death of the apostles, there will be no more revelation. A Roman Catholic claims that the Trinity is only known through later tradition (meaning the interpretation of the church, in RC understanding), church councils and creeds. Athanasius speaking of the Holy Trinity - well, since the Holy Trinity is scriptural and we Protestants agree with that, and Athanasius was writing against the heresies of the Arians, Sabellians, and Tropici, that is not a good example of something that becomes particularly Roman Catholic that Protestants disagree with, that is called as part of the "Rule of Faith" or "the Tradition". The Rule of Faith or "the tradition" spoken of by Irenaeus, Tertullian, Origen, and Athanasius are all doctrinal statements based on the organization around the Trinity, that are similar to the Apostles Creed, the Nicene-Constantinopolitan Creed, etc. that Protestants agree with that are in infallible Scripture. Although the word Trinity, and homo-ousias (same substance) and hupostasis (for person of the 3 persons formula for the Trinity) are not words for the Trinity in the NT (though hupostasis is used for Jesus' nature/ being in Hebrews 1:3, the word was later adopted for the person that is "existing under" the one substance (ousia); although those words are not employed in the text of the NT in the doctrine of the Trinity, the doctrine is Biblical in that the concept and doctrine is taught by harmonizing all that Scripture says about the Father, the Son, and the Holy Spirit. (and based on Matthew 28:19 and 2 Corinthians 13:14 and Matthew 3:13-17, and others). That is the proper role of theological development, or proper interpretations, which the Roman Catholic Church calls tradition also. (beyond the revelatory traditions that were apostolic, as in 2 Thess. 2:15 and 1 Cor. 11:2, etc.) There is proper doctrinal and theological development, and then there is improper (additions, corruptions), which is what the RC dogmas about Mary (beyond the ones Protestants agree with such as the Virgin Birth of Christ), Popes, indulgences, purgatory, penances, trafficking in relics, prayers to Mary and dead saints, priests, ex opere operato powers, Transubstantiation, etc. - these are man-made traditions that are not in the early centuries and not biblical. If you go back and look at the context of De Decretis (Defense of the Nicene Definition) 27, it is all about explaining Scripture. "this view was transmitted from Father to Father" just means the proper interpretation of the Deity of Christ and the Trinity, which Athanasius explains and Protestants agree with that. Athanasius (about 300-373 AD) mentions Origen, who was about a century before him. (250 AD) The quote does not go against Sola Scriptura, it merely is testifying that the Nicene Creed was Biblical. He was condemning Arianism and Sabellianism (Modalism) and Protestants agree with that. So that quote is not saying Creeds or Bishops or fathers are above Scripture, it is only saying that the fathers properly interpreted the Scriptures on that issue - the issue of the Deity of Christ and the Trinity, which is all Biblical. The To Serapion, On the Holy Spirit, against the Tropici heretics, 1:28 quote, is in Athansius' work on the Holy Spirit against the heretical group called the Tropici, and if you look at the context of that also, he is quoting Scripture about the Deity of the Holy Spirit, and the Trinity, and so the Tradition, the teaching and faith of the universal church at the time was the sound doctrine about the Trinity, which Protestants agree with, so that, (and the other quotes) do not exalt some extra-Biblical tradition above Scripture, but rather are expressing the proper interpretation of infallible Scripture. It is the same principle for the other 2 quotes; they are not exalting some kind of extra-biblical man made tradition over Scripture, but Athanasius is saying the proper interpretation of Scripture about the Deity of Christ and the Trinity is passed down by the fathers. A Roman Catholic commenter claims that praying to the dead is early and good. No; Scripture is clear and forbids praying to the dead. Pray only to God. The angel rebuked John several times for worshiping the angel. Revelation 19:10 and 22:8-9. Praying to Mary and thinking she is a co-mediatrix, is a clear violation of 1 Timothy 2:5 - for there is one God and one mediator between God and man, the man Jesus Christ . . . In later centuries, the church was wrong on over-exalting Mary and praying to her and having icons and statues to her later. The New Eve statements (Justin Martyr, Irenaeus, Tertullian) are not a big deal. God used her as the channel / instrument to bring the Messiah into the world. But the other stuff about Mary, which developed later, especially after Athanasius, Totally wrong. Mary was a godly woman and Jesus was born of the virgin Mary, but she was not perpetual virgin and we should not pray to her. Prayers to her are later anyway, but they are still wrong. She was not sinless, nor Immaculately conceived, nor bodily assumed. These are all man-made traditions. A Roman Catholic asks, "How do you think the Church Fathers read the Scriptures regarding Our Lady? Tertullian said she had a normal marriage after Jesus was born. She was not perpetual virgin. I mean, up until the late 4th century, the Epistle of St. James had not even been quoted in the west. Actually, 1 Clement 23:3 seems to be combination of James 1:8 and 2 Peter 3:4, and Clement of Rome is western, and dated at 96 AD. Also a strong case for patristic witness to 2 Peter. Even if it can be proven Athanasius did write the Homily of the Papyrus of Turin, it is just his opinion. It just does not sound like him, when I read his other writings. You are right, I am not infallible; but neither is any human - no bishop of Rome or "Pope" was ever infallible, not matter how much your RC Church claims it. Only Scripture is infallible (as opposed to interpretations later in history, non-apostolic traditions, creeds, church councils, bishops, priests, etc. ), because it is revelation from God, and only God is infallible. Since God is infallible and perfect, it is a function of His attributes; and Scripture is His Word, therefore Scripture is infallible. Since man makes mistakes, he and Popes and bishops cannot be infallible, since they are human. An RC commenter seemed to claim I was saying that 1 Clement taught Sola Scriptura. 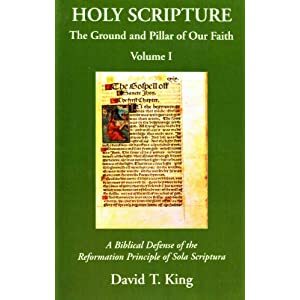 I did not say 1 Clement taught Sola Scriptura, rather I was responding to his claim that the epistle of James was not even quoted in the west until the late 4th Century. 1 Clement (96 AD) is actually proof that each church had a plurality of elders, and understood that the office of elder and overseer (bishop) was the same. 1 Clement 42-44. This confirms the clear teaching of Scripture in Titus 1:5-7 (elder and bishop same office/person); Acts 14:23 (elders - plural - for each church); 1 Peter 5:1-4 - each elder is to oversee and shepherd (pastor) the flock. Peter is "fellow-elder", not a Pope nor a "bishop over all other bishops", (a false doctrine that came along centuries later.) Acts 20:17 (elders) - Acts 20:28 - each elder is to oversee and shepherd the flock. Clement does not claim any special office for himself, never says "I am Pope" or "bishop over bishops" and writes "from the church at Rome" "to the church at Corinth". He was right to rebuke the schism and rebellion in the Corinthian church for deposing the elders because of jealousy, for they had no good reason to rebel against their church elders. There was no hierarchy of one bishop over the college of elders, until Ignatius, who comes a few years after Clement. ( Ignatius, around 107-117 AD) Even so, it was a practical practice, Jerome around 400 AD, agrees that bishops are elders and elders are bishops, and calls what Ignatius and others after him did, as "custom", rather than revelation/in Scripture. (commentary on Pastoral Epistles). The problem in Latin Christianity (later, Tertullian and Cyprian) was the conflating of the term of priest in the OT with the idea of elder in the NT. A priest in the OT (Kohen) was translated in the NT and Clement as heireus, priesthood as heirosunaes 'ειρωσυνης (in 1 Clement 43:2, which you quoted). In the NT, an priest is the Greek word heireus / 'ειρευς where that word in 1 Clement is derived. The Hebrew for that was Kohen כהנ and yet both Hebrew and Greek had other words for "elder" ( Greek: presbuteros / πρεσβυτερος ). There was another Latin term for those that offered the sacrifices in the temple (the priests). Latin = sacerdos, where we get "sacerdotal" from. But in English and in Roman Catholicism, the elder/ presbuteros and the priest / Sacerdos got combined into "priest" because they (what later became Roman Catholicism exemplified in the Mass and Transubstantiation - mainly developed from 800s AD to 1215 AD) wanted to combine the ideas of offering sacrifices with the office of elder. But in the NT, there is no sacerdotal office in the NT church, as Jesus was and is our mediator/ high priest, and priest according to the order of Melchizadek (Hebrews 5, 7) and He offered the last and final sacrifice, Himself. And when the NT does refer to priests and priesthood, aside from Christ, it is talking about all believers in Christ who are priests who offer spiritual sacrifices of praise and thanksgiving to God. (1 Peter 2:5-10; Revelation 1:6; Revelation 5:10) There is no special NT office of priests for the churches, as it was for Israel in the OT. Since elder in the NT was NOT a sacerdos, it was wrong for the Latin development of the word into priest, rather than to keep the two words separate and clear. Clement is pointing out that there was jealousy, envy and strive over the OT priests in the OT times; and there was jealousy and strive against the elders/bishops in the church of Corinth, but he is not saying that elders/bishops are priests like in the OT. The Corinthians were wrong to allow the presbyter-overseers to be deposed, and Clement rightly rebukes them for that; but Clement was not teaching any mono-episcopate or NT priesthood; and he clearly affirmed that elders and overseers (episcopos, translated sometimes as "bishop") are the same office, just as Titus 1:5-7; Acts 20:17, 28; 1 Peter 5:1-4; Acts 14:23; and Philippians 1:1, 1 Timothy 3, 5 show. The NT, 1 Clement, the Didache, and the Shepherd of Hermas show that the earliest NT and earliest in church history local church government was a plurality of elders and they were all expected to be shepherds (pastors) and overseers and there was no mono-episcopate; and definitely no "bishop over all other bishops". The mono-episcopte developed from Ignatius onward, and it grew to a bishop over a larger area, and then, centuries later, evolved into the claims of the bishop of Rome (as "Pope"), but the East never accepted such a claim. He clearly teaches that they are the same office, if you read 1 Clement 42 to 44 fairly. Those early pious beliefs or side comments (like using the word Eucharist, or "Catholic" or the "Mary as the New Eve" comments by Tertullian, Irenaeus, and Justin Martyr, or the respect shown to Polycarp's bones, or that they seem to teach baptismal regeneration, or the mono-episcopate from Ignatius onward, or the conflating of the Latin creation of the word priest from the Greek presbuteros that developed, etc.) by early church fathers that RC developed into later dogmas, are not things that mean a complete apostasy of the whole church in the early centuries (Constantine or a little later) at that time. The church existed even in the time of Wycliffe, Hus, Luther, though it has drifted far and was full of corruption. The real apostasy does not come until the Council of Trent in 1545-1563.